Isn't wonderful when a plan comes together? Isn't it even better when a plan you weren't expecting to come together comes together anyway? I give you McCall's 6696! I traced this pattern a looooooong time ago. But after tracing it, I started having doubts about the sizing and pushed it aside in favour of something requiring less brain power for me to make it work. I couldn't decide what fabric to use for it either. Fast forward to last week, when I found about 3 metres of a forgotten textured shirting cotton. A light bulb went on in my head and I decided to just bite the bullet and make McCall's M6696 with it. I don't know why but I fully expected it to be a fail. Well, it wasn't a fail and I'm so glad I waited all this time to make it just right. Except for a HUGE brain fart which I'll come to in a minute, making this dress went without a hitch and I absolutely love it. A lot. I chose to make version A. 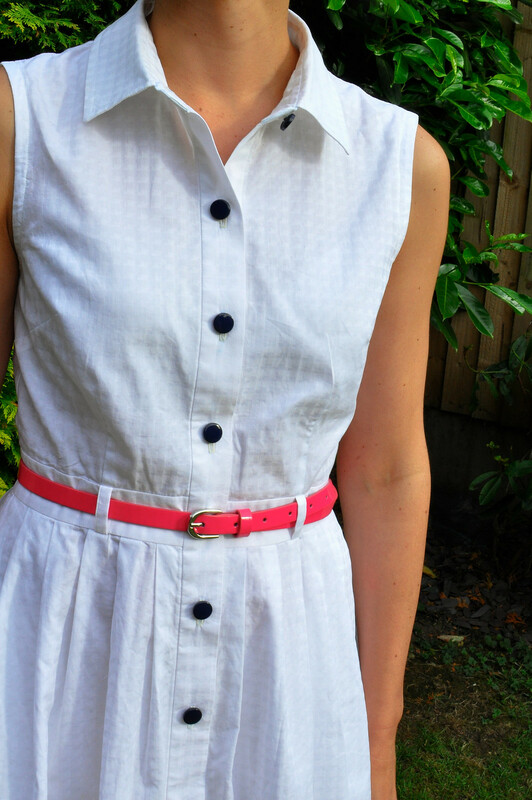 It's sleeveless, with a full pleated skirt and belt carriers around the waist. As you can see, darts shape the bodice front (I love that the waist darts match the belt loops!) and the back has a yoke and is shaped with some gathering. The instructions were very good. I didn't get stumped at all and all the graphics were very clear. One thing I was confused about was that the back skirt is meant to be seamed before pleating. I thought that was daft so I just eliminated that seam allowance and cut it on the fold instead. I did change the button placement slightly. I didn't like the way they looked near the waist band. My brain fart can be spotted on the pictures of the back. I sewed the skirt pleats inside out, didn't I? However, by the time I noticed it, the waistband was already on as well and the seam allowance had been trimmed. I decided to leave it rather than risking a wonky waistband. Plus, a fair amount of unpicking. It's in the back, so out of sight, out of mind seems to be the appropriate attitude. For the collar construction, I changed the sewing order and I'm never doing it any other way. I attached the outer collar stand to the neck first and go from there. My collar stand and plackets are perfectly lined up. It's all nice and cleanly finished on the inside as well and I found it way easier to keep it all in place while sewing. My hem is a machine sewn blind hem, which is my favourite at the moment. The fabric, as I said, is a textured cotton. It's a little see through, but that's because it's white. It was great to work with. It's perfect for this pattern and very well behaved. The buttons are from Duttons for Buttons, the Harrogate one. They're navy blue, not black, as it appears on these photos. I have some red, black, white and turquoise ones as well. They're gorgeous. 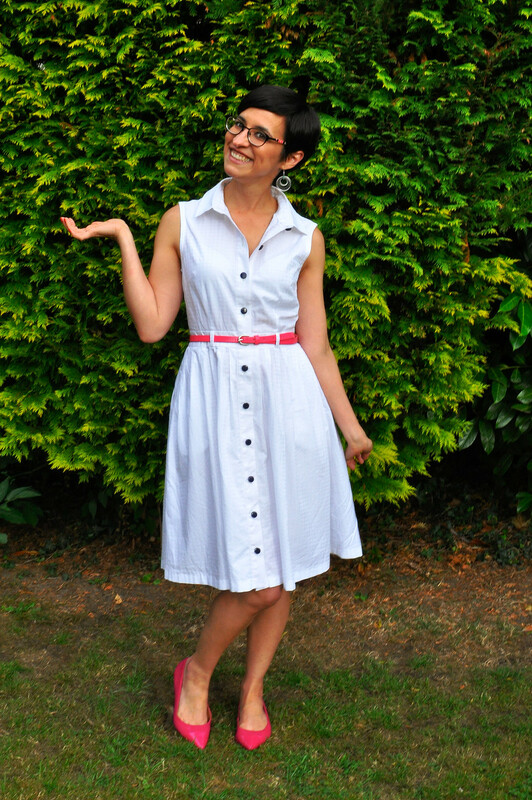 I love my new dress, despite the pleat screw up, and I definitely want to make some more. Maybe a slim skirt one next. I wore this dress for the first time last weekend, to go see The Red Shoes ballet production in Manchester. It was my first ever ballet and it was amazing.